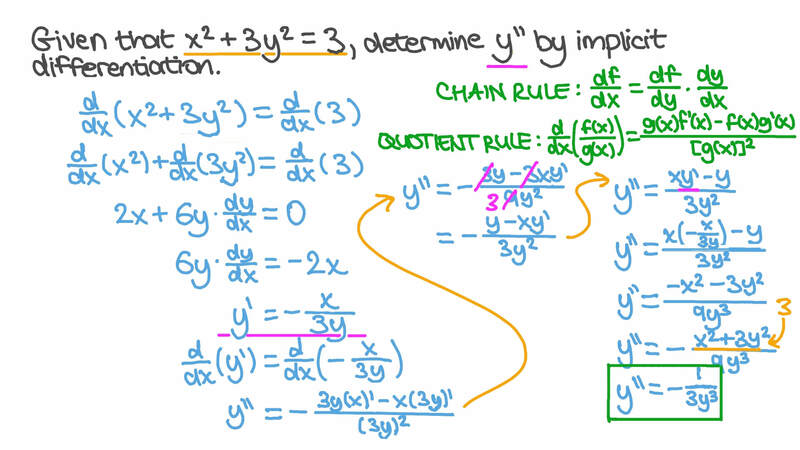 In this lesson, we will learn how to find higher-order derivatives by implicitly differentiating equations. Given that 𝑥 + 3 𝑦 = 3 2 2 , determine 𝑦 ′ ′ by implicit differentiation. Given that − 7 𝑥 − 7 𝑦 = 1 0 2 2 , determine 𝑦 𝑦 − 1 0 7 3 ′ ′ . If − 1 0 𝑥 𝑦 − 5 = 𝑥 2 , find 𝑥  𝑦 𝑥  + 2  𝑦 𝑥  d d d d 2 2 . Given that − 8 𝑥 − 3 𝑥 − 5 𝑦 = 0 2 2 , find 𝑦 𝑦 𝑥 +  𝑦 𝑥  d d d d 2 2 2 . Given that 5 𝑦 = 9 𝑥 3 3 , find 𝑦 𝑦 ′ ′ + 2 ( 𝑦 ′ ) 2 . Given that 𝑥 − 3 𝑦 = − 4 3 3 , find 𝑦 ′ ′ by implicit differentiation. Given that 2 𝑥 − 𝑥 𝑦 − 𝑦 = − 1 2 2 , determine 𝑦 ′ ′ by implicit differentiation. Given that s i n c o s 𝑦 + 2 𝑥 = 5 , determine 𝑦 ′ ′ by implicit differentiation. Given that 𝑥 + 9 = − 2 𝑥 𝑦 2 , find 𝑥 𝑦 𝑥 + 2 𝑦 𝑥 d d d d 2 2 . Let − 7 𝑎 𝑥 + 5 𝑏 𝑥 + 𝑦 = 9 𝑐 3 2 , where 𝑎 , 𝑏 , and 𝑐 are constants. Find 𝑦  𝑦 𝑥  +  𝑦 𝑥  − 2 1 𝑎 𝑥 d d d d 2 2 2 . Given that ( 6 𝑥 + 7 𝑦 ) = 4 7 , find d d d d 2 2 𝑦 𝑥 + 𝑦 𝑥 . If 8 𝑥 𝑦 = 7 4 𝑥 s i n , determine 𝑥 𝑦 𝑥 + 2 𝑦 𝑥 d d d d 2 2 . If 2 𝑥 𝑦 = − 1 7 5 𝑥 5 𝑥 s i n c o s , find 𝑥  𝑦 𝑥  + 2  𝑦 𝑥  d d d d 2 2 . Find d d 3 3 𝑦 𝑥 , given that 6 𝑥 + 6 𝑦 = 2 5 2 2 . If 𝑥 + 𝑥 𝑦 + 𝑦 = 1 2 3 , find the value of 𝑦 ′ ′ ′ at 𝑥 = 1 . Suppose that 𝑒 − 2 𝑥 𝑦 = 𝑒 2 𝑦 3 . Find 𝑦 ′ ′ when 𝑥 = 0 . Given that 𝑒 𝑦 + 3 𝑒 𝑥 = 5 𝑥 5 𝑦 5 , determine d d 𝑦 𝑥 at 𝑥 = 0 . Given that 9 𝑥 𝑒 + 𝑦 𝑒 = 7 − − 5 𝑦 7 8 𝑥 5 , find d d 𝑦 𝑥 when 𝑥 = 0 . If 𝑒 = 5 𝑥 − 4 𝑦 𝑥 𝑦 , determine d d 𝑦 𝑥 by implicit differentiation. Given 7 𝑒 𝑥 = 8 𝑦 + 5 𝑥 − 4 𝑥 𝑦 2 s i n , find d d 𝑦 𝑥 at 𝑥 = 0 . Find d d 𝑦 𝑥 by implicit differentiation if − 𝑒 𝑥 = 4 𝑥 𝑦 + 2 𝑥 𝑦 s i n .
If 𝑓 ′ ( 𝑥 ) = 𝑥 𝑓 ( 𝑥 ) , and 𝑓 ( − 9 ) = 6 , then determine 𝑓 ′ ′ ( − 9 ) . Given that 𝑥 − 5 = 7 𝑥 𝑦 2 , find 𝑥 𝑦 𝑥 + 2 𝑦 𝑥 d d d d 2 2 . Given that 𝑥 + 3 𝑥 𝑦 − 5 𝑦 = − 2 2 2 , determine 𝑦 ′ ′ by implicit differentiation. Given that − 2 𝑦 = 𝑥 9 7 , find 𝑦 𝑦 ′ ′ + 8 ( 𝑦 ′ ) 2 .